Medium - $24.99 Only 1 left! Did you know that a belief in fairies has been a worldwide thing for centuries? The strongest traditions of fairies are those from the British Isles and Europe, but belief in fairies has also been found in Asia, Native America, and Africa! Reputed to be a species of supernatural beings or nature spirits, fairies are actually one of the most important - and beautiful! - mythological concepts. Belief in fairies is ancient and widespread, and ideas about them have been found in primitive as well as civilized societies. And we gotta be honest with you - they’re such fun, magical, fascinating creatures, that even if it’s not true, we’re gonna choose to believe in the stories about them, anyway! Considered to be mischievous and whimsical in a childlike manner but contain strong magical powers, fairies are often said to be invisible, usually of smaller stature than humans, and are often helpful to humans, but will become angry and throw tantrums if offended. Sound like anyone you know?! If your little darling looks and acts like she appeared straight out of her own fairy tale, then this Halloween, give her the kind of costume that will make her feel right at home with those magical, mischievous pixies! 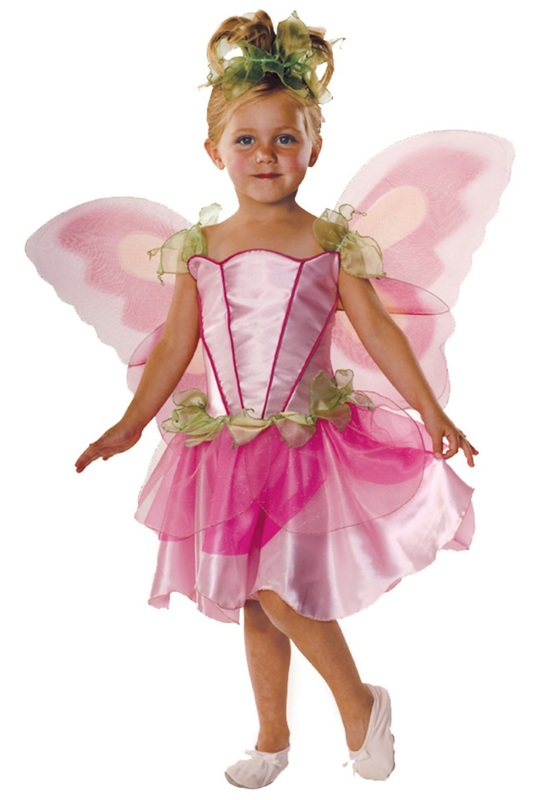 This Child Springtime Fairy Costume is a 100% polyester pink dress is a pure magical confection, featuring light and dark green and pink sheer petals on the shoulders and waist! It also has boasts the cutest little pink and light orange wings, attached to the back of the dress. The costume even comes with a green elastic headpiece that will make her feel like the queen of the fairies! Add a pretty, sparkly, sequined wand and cute little ballet slippers, and watch your little magical creature fly away on her own glittery fairy dust! I only have 1 small complaint. The wings did not stay up at all when the larger wings were worn on top. So, we switched the wings so the bigger ones were on the bottom. Worked well from there! Was able to layer clothes underneath and it looked fantastic!